This large and aggressive knight Heartless's skillful defense makes it tough to finish off. Though its focused slash can be stopped with a block, blasting the knight with Thundaga while it is storing up energy will stagger it, opening it up to extra damage, especially from magic. This cutting creature paralyzes its foes. Take it down before it has a chance to attack. The Dual Blade is an Emblem Heartless that was introduced in Kingdom Hearts 358/2 Days. It is one of the bosses at Halloween Town. A Dual Blade is a large, humanoid Heartless covered from head to toe in silver and grey armor. The armor on its legs sport white spikes and steel blue highlights. Its helmet sports two short, white spikes and a long, twisted, black antenna. A small opening in the front just barely exposes the Dual Blade's black face and glowing yellow eyes. Its most notable features are the blue interweaving blades in place of each of its hands. It has two Heartless emblems, one on each of its shoulder pauldrons. 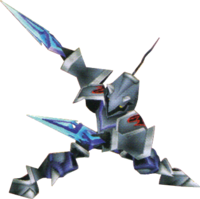 The Dual Blade's name is a clear reference to the two blades on its arms that it uses to attack. When facing a Dual Blade, it is best to keep in constant motion to avoid the Heartless's attacks. Block its spinning thrust attack, and jump to avoid the Aerora spells it launches. When the Dual Blade jumps high into the air, be sure to jump and Glide out of the way, or suffer damage when it comes down and causes a short-ranged shockwave to erupt. A well-timed Dodge Roll can also prevent damage. When the Dual Blade charges power, immediately Block to avoid the powerful long-range slash attack that follows, as it may inflict the Air-toss status effect. 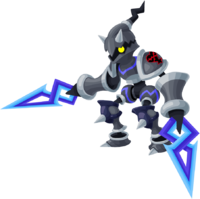 Blocking this attack successfully will cause the Heartless to collapse, increasing damage that can be done with magic or attacks. As the Dual Blade's journal entry suggests, Thundaga will have the same effect on this Heartless. Once it recovers, the Dual Blade will use the attacks in its arsenal at random. Be sure to heal when necessary. On Mission 54, the pumpkin bombs on the floor are pretty useful. After hitting one, lure the Dual Blade near it, and the explosion should take out 1 bar of the Heartless's HP. This page was last edited on 6 September 2018, at 22:07.